Car camping is one of the great joys of life, and with the Rapid Shelter 3-Season 6-Person Tent, you can basically skipping the setting-up part and go right to enjoying your time outdoors. 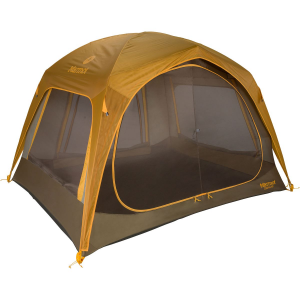 This tent's single pole sets up and clicks into place quickly while a generous rain fly protects your whole shelter from the elements. Store your flashlights and extra snacks in the gear loft, and even hang an electric lantern inside with the convenience of a power port on the side for extension cord access. Car camping never felt so much like home.